Jean Guay was born in Montreal, Canada and settled in Southern California in 1959. Not much is known about his early life and after his passing, a proper funeral was never given as relations with family members were nonexistent. From 1959 to 1977 he hiked and backpacked the Sierra Nevada mountain range, covering more than 7,200 miles and traversing 150 mountain passes. During this journey he photographed and sketched the mountains in preparation for painting in oil, which was his primary medium. More than 20,000 photo slides of his adventures and some 400 paintings were created as a result of this trip. 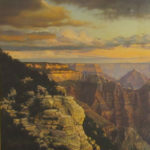 Guay moved to Incline Village, Lake Tahoe, Nevada in 1977 which provided a secure location for him to paint a variety of Lake Tahoe and Sierra scenes. The local gallery "Art Attack" sold his works at Incline Village. Clouds are hard to paint and Guay really knew his clouds. He knew the specific areas in the Sierras that had the specific clouds to their region; he really knew their nature. He would listen to classical music while he worked because it gave him inspiration. Many of Guay's paintings are called "Opus"paintings, referring to the symphony in the clouds, the deep feeling. In the last 15 years of his life Guay's work was selling briskly. Having never reproduced a work of art, he would price his pieces depending on how much emotion and time was dedicated to the particular painting. In 1996, a moonlight trek to the 14,495-foot summit of Mt. Whitney yielded dozens of photographs that Guay painted. In the last few years of Guay's life, he depended on his slides to continue his work because of his failing health.